And because I think rainbows are a lot more fun for St. Patrick's Day than just shamrocks! And if you can find blueberry jello, PLEASE tell me where. It is an essential ingredient in our red, white and blue 4th of July Jello and it is HARD to find! I have some in my pantry and that's where I found it. We have a larger one so if you are having trouble finding it at your HEB, maybe check an HEB Plus. and it will show you the closest walmart to you that sells the berry blue flavor! though I am not a jello person that is really cute! Walmart has blueberry jello but you have to buy the brand name. I just bought some this morning. Good luck! 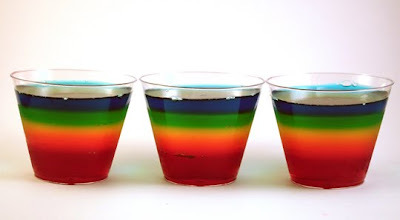 I've been making rainbow jello this morning for dinner...fun stuff! I'd even be willing to send you some blueberry jello if you get desperate!